On the days when you walk around to clear your head it’s amazing what you can see…. 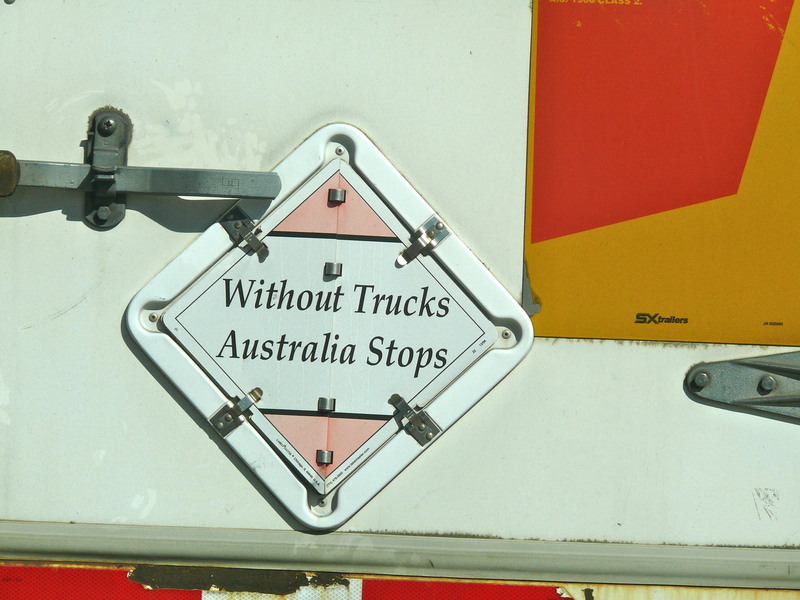 A sign on the back of a truck which is very true because when you think about it without trucks and the transportation industry the world would probably come to a stop. And such a find to see a beautiful soul gazing down at me. My dear old friend the Kookaburra. It aways cheers me to see a Kookie. Aaaah, walking. What would I do without you? You always clear my head. Oh Selma, I do love the kookaburra! He always brings a smile to my face. He looks so silly because of that ridiculous tuft of hair. Gives me a smile to start my day! They are cute and comical birds, Cathy. I know exactly what you mean. Every time I see one I smile…. they just have that power. A real joy out there in the wild! Oh…I’m another fan of your Kookaburra…just a delight set of images…thanks! They are lovely birds, slpmartin. 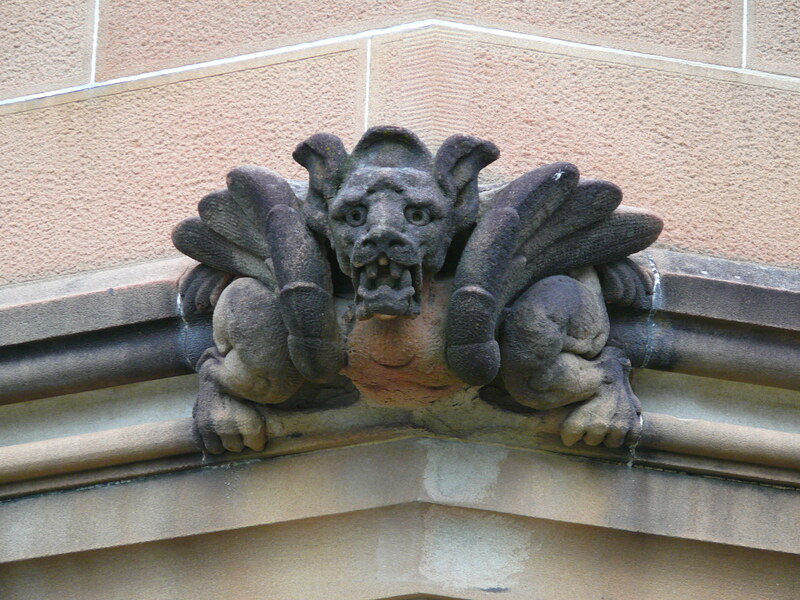 We are so lucky to have them coming back to the city because for many years they were gone. Looks like planting all those trees worked! 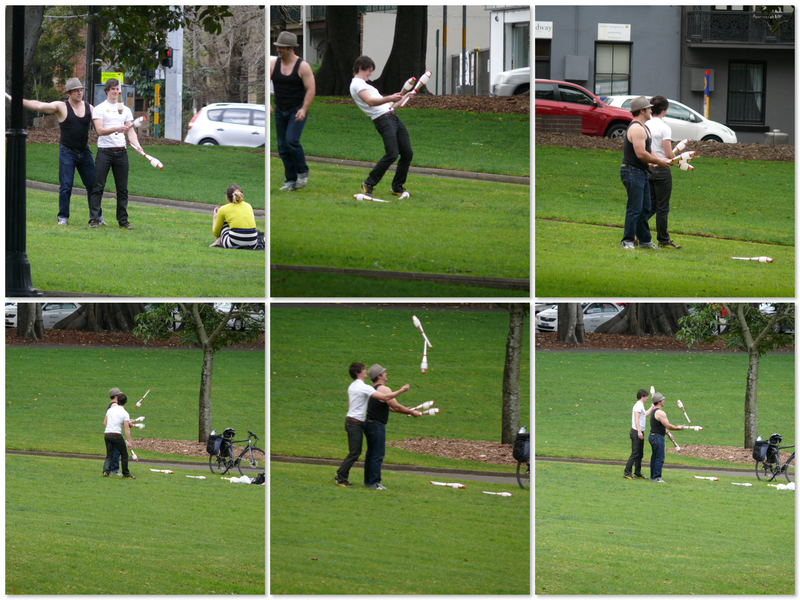 Love the jugglers 🙂 – we certainly don’t see that in the distant ‘burbs. 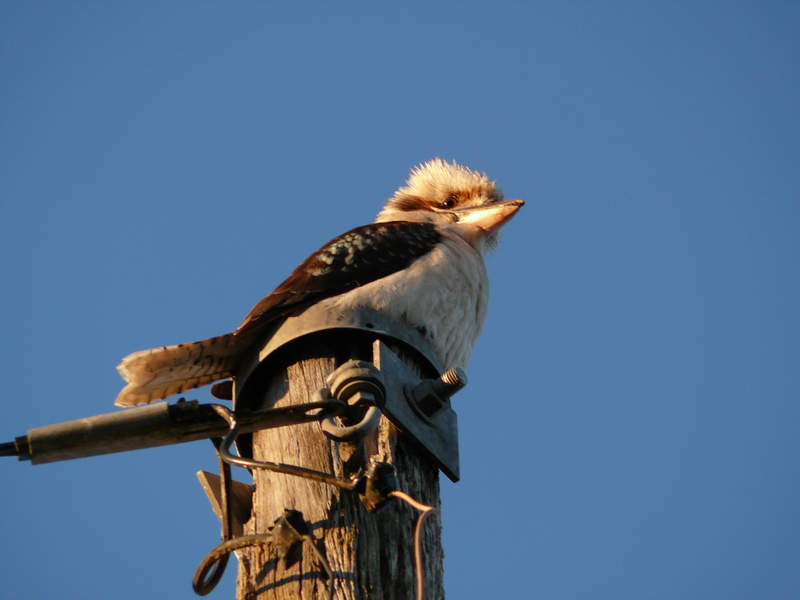 And the kookaburra – they looks so squeezable when they’re all puffed up like that. Lovely post, Selma. I Love the kookies when they’re puffed up too. Awwwww. Wonderful pictures and it’s so true about the trucking industry. Oh yeah. And the rail industry. I watched this show the other day about how the railroads built America and it’s so true. Quite incredible what the trains achieved. It is my pleasure to share the land of Oz with you, sirrah. I am enjoying it! I would need to study the jugglers–I have always wanted to learn, but never have. It is a good sign as well to see the jugglers in warm-weather clothing. Your hot weather is not too far away. I saw a juggler at a street fair recently, Slamdunk, and he was amazing. I would love to be able to juggle too but sadly don’t have the coordination. It looks so cool, doesn’t it? The other thing I’d love to be able to do is a perfect somersault. Can you imagine just doing one in a public street? I’d love it. And yes…. there are hints of warmer weather all around! : Without truck stops, trucks wouldn’t stop. Juggling is an art I have tried and never got past one club. Pathetic. 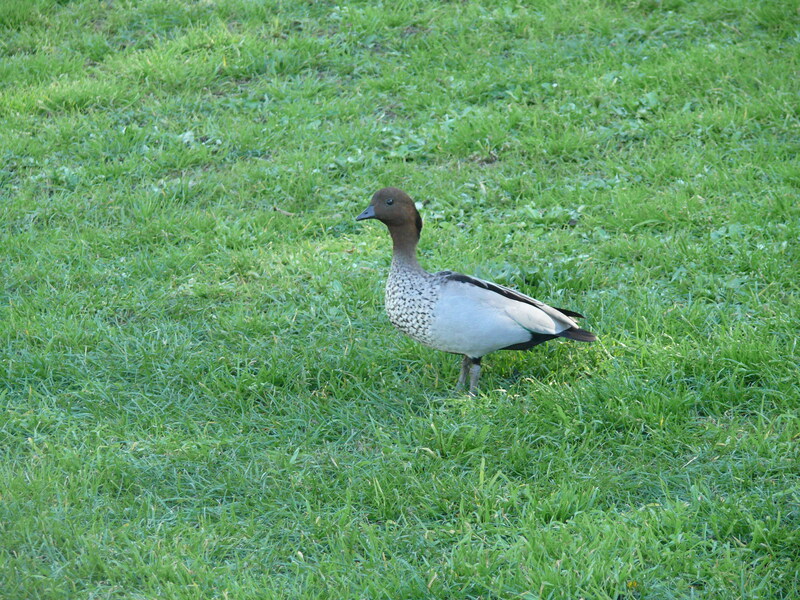 But just to show you I know a thing or two, I can tell you, the bird in the first photo, here often called a grey duck, in Victoria is called a maned goose. If you look closely, the beak is a goose beak, not a duck beak, and I can tell you as an ex farmer, they can eat about twenty thousand lettuce seedlings in a single sitting. I used to employ a gas gun to fire off all night over the three days of every full moon when they would otherwise visit in their hundreds. One more thing. They mate for life… unlike me. 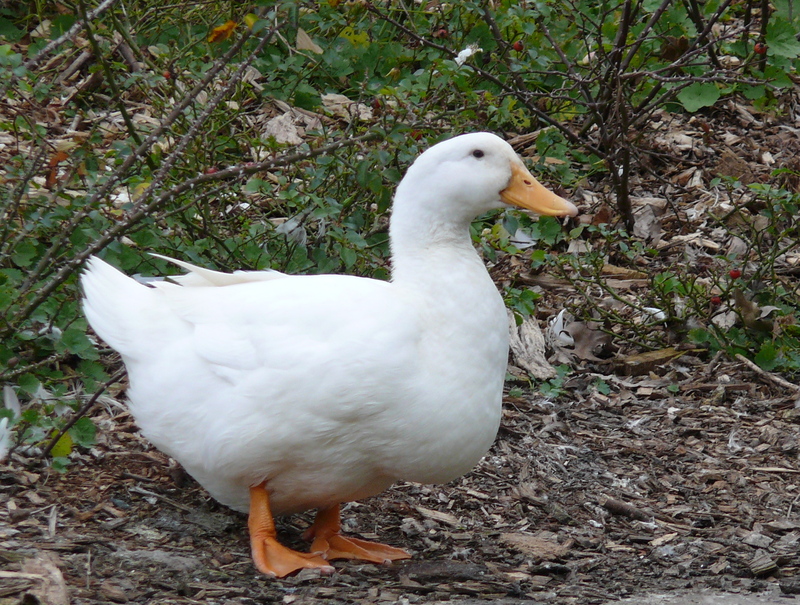 It’s awful, Stafford, but I will freely admit I don’t know my ducks from my geese. I really need to study them more. I didn’t realise he was a maned goose. How cute. I know geese can strip a field fairly quickly – they are real gobblers. That’s interesting that they all came during a full moon. What a fantastic story. I love anything to do with farming and wildlife. A lot of birds mate for life, don’t they? That intrigues me too. We have a lot to learn from the bird world. QWACK!!!! I always have the urge to squeese ducks – must be a result of all those yellow rubber duckies around when I was a kid (they are so cute – and so are geese you big goose Stafford 😉 ). I think walking might be one of your main stress reducers Selma (and observing the life and art around you) – when you’re on a good thing, stick to it (as the advert used to say – can’t remember what it was for though). I want to squeeze ducks too, Gabe. I had a HUGE rubber duckie collection when I was a kid and have always had a fondness for the little quackers. The ones at the park are very chubby and terribly squeezable. Walking does reduce my stress so I’m going to stick with it. It takes my mind off things and I guess is also keeping me a little bit fit, which can’t be a bad thing. I respect truck drivers too, Lauri. It’s a tough job, especially those long haul trips. Plus, I like riding in big rigs. It’s fun. You feel like you’re hovering above the road. I wouldn’t have minded being a truckie except for the fact that I know my road position would have been bad on the corners. I would probably have taken the side of the road out turning the corner. Haha. Renegade truckie!!! The kookaburra song is a cute song. Amazing how many people who live outside of Australia know it! I love sight seeing, Lissa. It’s one of my favourite things to do and you don’t need to be a tourist to do it. Always cheers me up. Hope you get to see a real kookaburra some day! Ah. Mr N for Nietzsche is said to have said that all great thoughts are conceived by walking. Others have said that he said ‘while walking’. Either by the while, or while the by, I tend to agree. I can see that some people could come up with some great thoughts indeed while walking, Brad. I do not aspire to such greatness but some interesting thoughts do pop into my head while strolling along. Definitely an efficacious past time. What a great idea, Josie. I will certainly look into it. There are so many great sights around here with so many accompanying stories. I would enjoy turning that into a book. Thanks for the inspiration! Love the ducks and the kookie. You guys have so many fun creatures. Have u ever eaten crocodile, camel or kangaroo meat? Saw it in a travel program and except for the crocodile, the meats look delicious. I’ve eaten kangaroo and croc meat, Roshan. I didn’t really like either of them. The flavour takes a bit of getting used to. A lot of people really like it, though. Kangaroo meat, in particular, is supposed to be quite low in fat, so I guess it’s a reasonably healthy option. I’m not a big meat eater anyway, but I think I’ll stick with beef. Fabulous photos! I never see that much interesting stuff while walking around NJ! Maybe I am not looking closely enough? You are probably doing the power walk, Meleah, while I am a bit of a stroller. Plus, I have kind of trained myself to look for things. I am sure there are hundreds of interesting things to see in NJ. If not thousands. I’d love to wander around there myself. That would be cool. They are extra special birds, Bandsmoke. I love them to bits. So glad you like him!! !